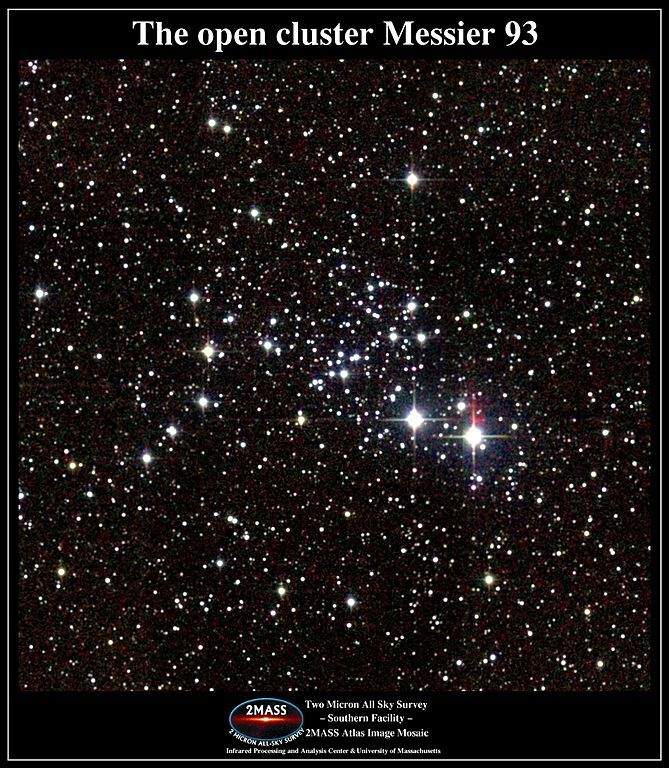 Messier 93 has the designation NGC 2447 in the New General Catalogue. The cluster has an apparent diameter of 22 arc minutes, roughly two thirds the size of the full Moon. This corresponds to a spatial extension of about 20 to 25 light years. M93 can be seen without binoculars under exceptionally clear, dark skies, and is easy to find with binoculars. It has an apparent magnitude of 6.0. Binoculars and small telescopes reveal the triangular shape formed by the cluster’s brightest stars. Small telescopes show a large, dense star cluster with a grouping of stars shaped like an arrowhead near the centre. 8-inch and larger telescopes resolve dozens of stars in the cluster. Messier 93 is not very hard to find as it is located in the same area of the sky as Sirius, the brightest star in the sky. Located in Canis Major, Sirius can be found using the stars of Orion. A line drawn through the three bright stars of Orion’s Belt extended southward leads directly to the star. About 8 degrees to the southeast of Sirius are the two components of the Omicron Canis Majoris system: Omicron-1 and Omicron-2 CMa. 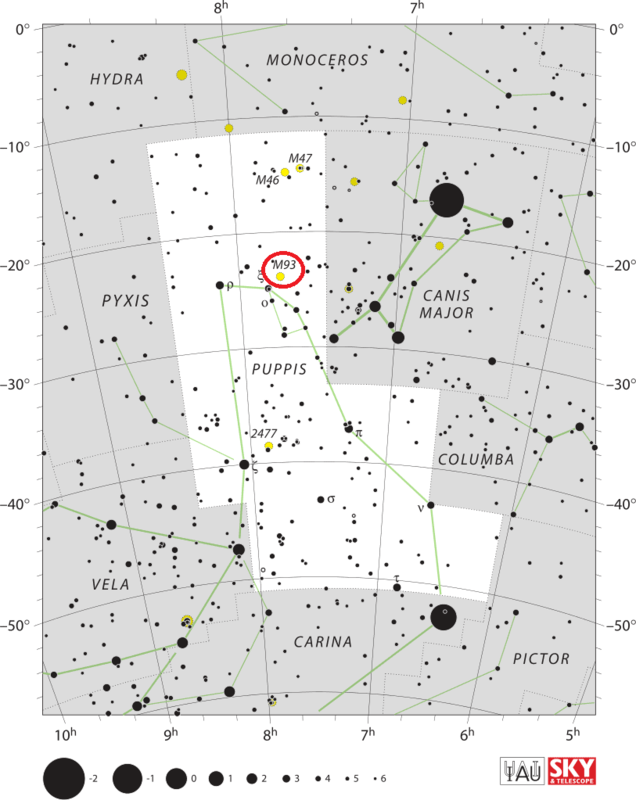 A line connecting the stars extended to the east and a little south for about 10 degrees leads to M93, which lies near the magnitude 2.21 star Zeta Puppis. The best time of year to observe M93 is during the winter. The cluster contains about 80 confirmed members and there are probably hundreds more. 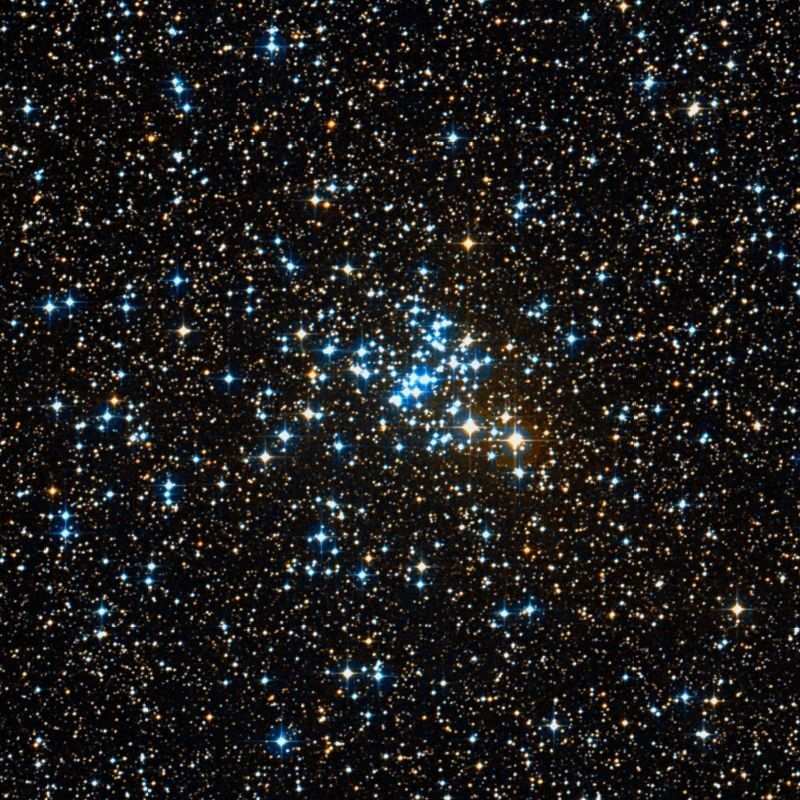 The brightest stars in M93 are type B9 blue giants. The cluster also contains at least three red giants. The estimated age of the cluster is 100 million years. Messier 93 has a Trumpler classification I,3,r, which means that it is detached from the surrounding star field with strong central concentration (I), it contains bright and faint stars (3), and is richly populated (r). The ship Messier was referring to is Argo Navis, represented by the Greek constellation Argo Navis, which has since been divided into three smaller ones – Vela, Puppis and Carina – each representing a part of the ship: the sails, the stern, and the keel and hull. Nebula, about 1 1/4 deg north preceding the bright star in the Ship [or more exactly] preceding the 1st Navis [Puppis; she probably meant 7/Zeta Navis, not 1/Rho] towards 23 Canis majoris. My Brother examined it with [magnification] 460 and found not less than 20 stars, with 227 above 40. with a compound eyepiece perhaps 100 and 150 very beautiful, nothing nebulous among them. Messier has it not. Messier 93. Atlas Image mosaic] obtained as part of the Two Micron All Sky Survey (2MASS), a joint project of the University of Massachusetts and the Infrared Processing and Analysis Center/California Institute of Technology, funded by the National Aeronautics and Space Administration and the National Science Foundation. A small galaxy cluster, in the aplustre of the Argo’s poop [Puppis]; a line from Orion‘s sword-cluster, led through Sirius, strikes upon it 16deg beyond, where it will be intersected by a ray from Castor through Procyon. The neat group is of a star-fish shape, the sp [south preceding, SW] portion being the brightest, with individuals of 7 to 12 magnitudes: it was first registered by Messier, in 1781, as a mass of small stars. The unlucky Chevalier d’Angos, of the Grand-Master’s observatory at the summit of the palace of Malta, mistook this cluster for a comet: from which, and some still more suspicious assertions, my excellent friend, Baron de Zach, was induced to term any egregious astronomical blunders – Angosiades.